The phenomenon of DNA hole transport (HT) has attracted of scientists for several decades, mainly due to its potential application in molecular electronics. As electron holes mostly localize on purine bases in DNA, the majority of scientific effort has been invested into chemically modifying the structures of adenine and guanine in order to increase their HT-mediating properties. In this work we examine an alternative, never yet explored, way of affecting the HT efficiency by forcing electron holes to localize on pyrimidine bases and move between them. 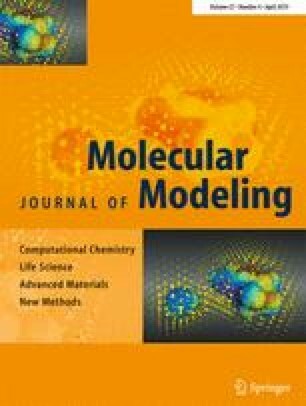 Using an enhanced and revised version of our previously developed QM/MM model, we perform simulations of HT through polyadenine, polycytosine, polyguanine, and polythymine stacks according to a multistep hopping mechanism. From these simulations, kinetic parameters for HT are obtained. The results indicate a particularly high efficiency of cytosine→cytosine hopping, which is about ten times higher than the G → G hopping. We also discuss possible improvement of cytosine HT by modifying the oxidoreductive properties of complementary guanine residues. The online version of this article ( https://doi.org/10.1007/s00894-019-3976-9) contains supplementary material, which is available to authorized users. All calculations were performed using the computational resources provided by the University of Arizona and by the Interdisciplinary Centre for Mathematical and Computational Modelling at the University of Warsaw (as part of G18-6 grant), for which we are grateful.